The AIO is the easiest of diapers to use and the closest option to the disposable diaper but also the most expensive. The soaker or insert is sewn into the diaper either externally or internally. Some AIO diapers dry better then others but all of them take much longer then their alternatives that I cover below. The bumGenius Freetime dries much better due to the fact that the insert is sewn in but hangs loose. The Thirsties Duo AIO's soaker is sewn to the diaper on two sides so it creates a pocket that air can get through during the drying process. The addition of this pocket makes it a "Stuff-able AIO" This feature is great because I can add booster inserts in this pocket to get my little one through the night. Personalized absorbancy by adding desired amount of soakers, prefolds and inserts. A diaper cover is just a cover as you can see in the picture to your right. There are numerous options on what you can use inside a diaper cover including fitted diapers, prefolds, inserts, soakers the list goes on and on. 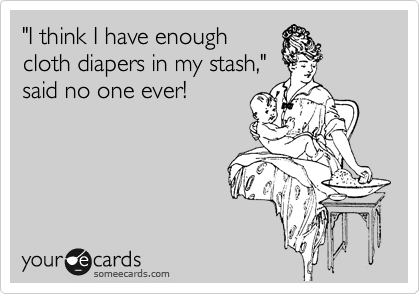 You can use just about anything in your diaper stash that holds liquid in a diaper cover. Prefolds are a rectangular piece of cloth divided in 3 sections. They can be folded twice to fit into a diaper as an insert or you can use snappi or pins to use it like a fitted. (This is closer to the ways the previous generation would have used cloth diapers) Some of my favorite prefolds have been the Econobum which are pictured to your right. Below is the Econobum Diaper Cover ready for any insert, prefold or fitted diaper. To your left is the BabyLand OS Pocket Diaper at its largest setting and on your right is the same diaper at its smallest setting. As an add on thought... Velcro is a name brand but two products that are similiar are Aplex and Touchtape. Aplex is softer has a longer life and doesn't roll like touchtape sometimes does. Touchtape has a stronger stick and is available in a variety of colors.